Even though some people may argue that the Israeli food culture isn’t unique since it’s very young, all must agree that it’s quite delicious. However, the Israeli people also have their say in this story. They are calling upon the Old Testament and talking about the magical manna which kept the Hebrews alive while in the desert. Be as it may, let’s say that the Israeli kitchen contains elements of ancient Hebrew dishes, Israeli’s neighbor cuisines such as Morroco, Algeria, Tunisia or Libya and the neighboring cuisine from the Middle East(Iraq, Yemen, and Lebanon). We must not forget that the Jewish immigration from all parts of Europe also had a huge influence on the Israeli kitchen. When you bring all those ingredients together, you get a terrific cuisine which is to die for! The Israeli Cuisine is a delicious combination of a lot of dishes but here are some of the main dishes you must try while in Israel! Of course, the number one Israeli dish is Falafel. If you’ve been to Israel and haven’t tried Falafel, why did you even bother traveling? To be honest, Falafel is probably of Egyptian origin. It is a terrific combination of chickpeas and fava beans. Of course, spices must be added according to the cook’s recipe. Roll these falafel balls into a pita and place it next to hummus, sauces, vegetables and eat up! If the restaurant doesn’t sell falafel, it’s not Israeli. 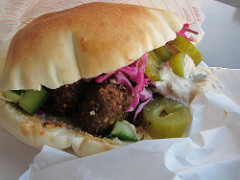 You can find falafel everywhere, especially in bigger cities such as Jerusalem and Tel Aviv. It is fairly cheap, around 13 shekels per portion. It’s a very tasty meal and a basic tradition among the Israeli people. Another traditional Israeli dish although it originates from Lebanon. Hummus is a spread made out of chickpeas and tahini sauce, lemon, garlic, olive oil, and salt. It is often used as a side dish if you’re having a big meal. However, it may be served with fava beans and hard-boiled eggs. 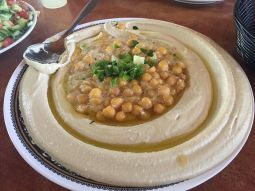 Hummus is so widely used that you can find it in almost every supermarket, although we recommend trying it the traditional way, in an Israeli restaurant. Don’t be afraid to visit dodgy places filled with people since most of these places are Hummusiyah or hummus cafes. Once you try hummus, you’ll understand why are these places so crowded. Even though it doesn’t look that tasty, the first try will prove you wrong. The magic of hummus will take you under its own. It is widely accepted that the Egyptians used chickpeas as a traditional dish somewhat 7000 years ago. However, mashing chickpeas into hummus became popular somewhere around the 1200s. The first documentation made on this beloved dish was in Damascus in the 19th century. As far as spelling is concerned, there is a number of different spelling and pronunciation you’ll stumble upon. We’ll go with the traditional hummus spelling and focus on the taste. The first and the best way is to go to Hummusiyah(a hummus restaurant) and take a plate of one of the best Israeli dishes there is. Watch the Israeli people and eat like them. Or simply ask a friend how to eat hummus. The main tip we have for you is to pick up the hummus with some pita bread. Forget the cutlery since you won’t be needing it. The other ways of eating hummus are as a side dish or inside your pita filled with schnitzel, shwarma etc. Hummus is an inseparable part of the Israeli tradition and it’s really healthy. The average Israeli loves hummus because it’s one of the rare dishes which is both tasty and healthy. Hummus contains omega 3 and a lot of nutrients and vitamins. Schwarma is another traditional meal in the Israeli cuisine. 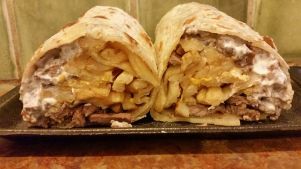 If you don’t have a clue what it is, it’s similar to Turkish doner kebab or Greek gyro. You can find Schwarma almost everywhere in Israel since it contains all the basic elements of Israeli food. Pita, salad, hummus, tahini sauce. If you’re a meat lover, you’ll adore Schwarma and you’ll like it even better than hummus or falafel. If you’re really hungry, try Laffa. It may cost more (around 30 shekels) but you won’t have to eat again that day. Israeli cuisine is very interesting since some meals are time/day-related. 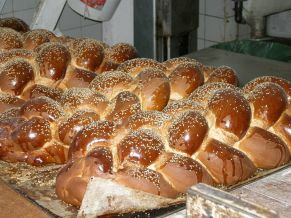 For instance, the Israeli usually eat Lechem bread on Fridays and Jachnun on Saturday mornings. In restaurants, it may be available throughout the whole week. Jachnun is made out of rolled dough and margarine. After it’s made, it is cooked overnight for more than 10 hours. 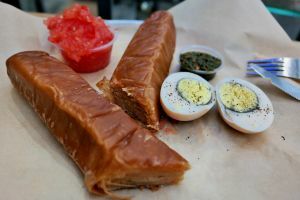 Jachnun can contain grated tomato, Yemenite Schug which is spicy as hell, a hard-boiled egg and other desired delights. Shakshuka is often underestimated due to its peers Hummus and Falafel but even though not as popular, I guarantee it’s as tasty as these two dishes. 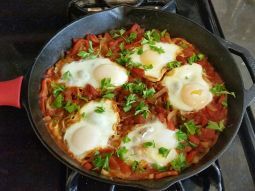 Tomatoes, a lot of garlic, sweet paprika along other spices and a poached egg on the top will make a great Shakshooka. The price is also great. Also, make sure you eat shakshouka with pita, walnut bread or even Lechem bread if you have the opportunity. There are all kinds of bread in Israel, walnut, pita, taboon pastries. However, in our opinion, none of them compare with Lechem bread. It may be difficult to find the right experience since Lechem bread is best at someone’s home during The week and Chala bread is a must in A Shabbat dinner. You might want to try some of the websites which offer eating with the locals to experience true Israeli cuisine. Vegans and vegetarians are going to love Israel since there’s not so much meat in their traditional cuisine. However, there are some dishes containing meat that must be dealt with. Baked sweet potatoes and meatballs are a must-try, especially if you’re in Jaffa, Tel Aviv. Tahini is made out of nigella seeds and it’s a product with one of the highest demand in Israel since it is an irreplaceable ingredient of many Israeli dishes. Besides olive oil and garlic, tahini is a fundamental ingredient for hummus, shawarma, Chalba, salads and even eggplant baba ganoush. If you’re going to feast on Israeli cuisine, you can’t possibly avoid trying tahini. If you’re stuffed and you only have room for dessert, give Kanafeh a go. 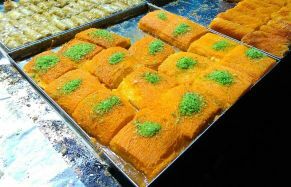 Kanafeh represents an Arabic dish and has a huge popularity in Israel. It’s a pastry made of cheese and soaked into a syrup. It tastes better than it sounds, believe me. Restaurants in Jaffa are well-known for their terrific Kanafeh. You can also get great Knafeh in Mahane Yehuda in Jerusalem. One more dish which has origins from somewhere else. However, that’s what makes the Israeli cuisine so different than the others. Georgian cheese bread or Khachapuri is a must-try when in Israel. Adjaruli Khachapuri is something which will delight you. It’s a boat-shaped Khachapuri named after a region in Georgia. There’s a half-hour baking time but it’s well worth the wait. The ingredients are dough, Georgian cheese, a little butter and an egg in the middle. 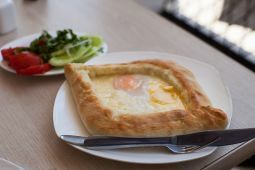 Of course, this meal has other variants with different fillings but the yolky center is the traditional way to make Khachapuri. After all these meals, a pomegranate juice will feel heavenly refreshing. The name speaks for itself and I guarantee that the taste is magnificent. As we mentioned before, Israeli kitchen takes its authenticity from the fact that it is formed from many different dishes from all over the world. The Jewish people all around the world have a different way of preparing since they have taken what’s best from all over the world. That’s why, in Jewish kitchen, you’ll find pieces of Arabic, Palestinian, European and Middle Eastern techniques. We must admit, that all these techniques are perfectly combined and to our delight, a whole new cuisine has been created.